“SUPER NINTENDO WORLD™” is coming to Universal Studios Japan and will be the first such opening in the world*1, featuring globally renowned characters and game worlds from Nintendo. Super Nintendo World is targeted to open in time for the 2020 Tokyo Olympics. While Universal Studios Japan will be the first location to open, Nintendo themed areas are also coming to Orlando and Hollywood as announced by Nintendo and Universal Parks & Resorts on November 29, 2016. 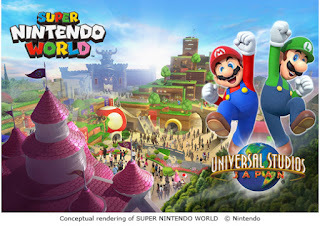 Super Nintendo World will be comprised of expansive and multilevel environments filled with unprecedented, state-of-the-art rides*2, interactive areas, shops and restaurants, all featuring Nintendo’s most popular characters and games. Development cost at Universal Studios Japan is currently expected to exceed 50 billion Yen. Super Nintendo World will be developed mainly using the park’s current parking area and part of an area designated for future expansion. Katsuhiro Miyamoto, Professor Emeritus of Kansai University estimates that Universal Studios Japan — after opening Super Nintendo World — will bring economic benefits following its opening of approximately 6.2 trillion Yen for the Kansai region, 11.7 trillion Yen for Japan as a whole, and will create approximately 1.1 million jobs in Japan within a decade after opening*3. Universal Studios Japan will introduce the wonder of the world-class, Japan-based entertainment brand of Nintendo not only to Japan but to the world.